A 21-year-old man who strangled and decapitated a boy and bludgeoned a girl to death when he was 14 in one of Japan’s most notorious juvenile crimes was paroled Wednesday, having spent more than six years at a medical reformatory, the Justice Ministry announced. Authorities provisionally released the man from the institute in suburban Tokyo after he completed rehabilitation and education programs. The offender was in his third year in junior high school when he committed the two murders and wounded three other children in Kobe in 1997. A three-member panel of the Kanto Regional Parole Board accepted the request for parole, filed in March 2003. Tetsuo Obata, chairman of the parol board, told reporters that the board judged he has been rehabilitated to a desirable level and should be released so he can make a smooth return to society. To help the man proceed with rehabilitation in society until his detention term expires at the end of December, the board has selected a place where he will live and mapped out plans for his daily life, Obata said. The place of residence will not be released so he can quietly obtain work and become able to support himself, Obata said. The man’s name likewise will be withheld because he was a minor at the time of the crimes. Obata said the government announced his release in response to public interest in the crimes he committed. “Considering the peculiar and grave nature of his crimes, we thought public cooperation for his rehabilitation is essential,” Obata figured. 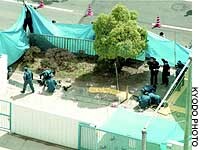 The killer was sent to the special medical reformatory for juvenile offenders in Fuchu, western Tokyo, in October 1997 to receive psychiatric treatment and counseling. He was transferred to an ordinary reformatory in November 2001 to learn some social skills, before returning to the medical reformatory in November 2002. He killed 10-year-old Ayaka Yamashita in March 1997 and attacked three other schoolgirls in February and March that year. On May 24, 1997, he killed and then decapitated 11-year-old Jun Hase, leaving the head outside a school gate. Sources close to the case said the man has read notes written by the victims’ families and has said he would like to find a job to pay them compensation. The sources quoted him as saying he would not forget the severity of his crimes and would like to spend his life making up for them. Lawyer Yoshikuni Noguchi, who served as the man’s counselor during the juvenile trial, cautioned: “If people around him make a big fuss and put him on the spot, it would make it difficult for him to reintegrate into society. “By realizing the value of his own life, he now feels he wants to make up for having taken people’s lives. He has grown up a lot in a short period of time. I am not worried” about the possibility of repeat offenses. Meanwhile, the families of the victims have urged the government to provide them with information on the perpetrator. Some relatives question whether he really has been rehabilitated. Hase’s father, Mamoru, 47, said in a statement after learning of the release: “The most important issue is whether he is really rehabilitated. Hase said the Justice Ministry’s rare decision to provide the victim’s relatives with advance information regarding the release was an improvement. Currently, such notification is only applicable in criminal cases involving adults. Hase urged the ministry to apply it to juvenile cases as soon as possible. In a separate statement, Yamashita’s mother, Kyoko, 48, said that while she would like to believe the man has been rehabilitated, she wonders if a person who committed such brutal acts can truly be reformed in such a short time. Prime Minister Junichiro Koizumi meanwhile told reporters there was probably no other choice but to release the man in order to give him a chance to rehabilitate himself. But he said he had “mixed feelings” about the man’s release when considering the sentiment of the victims’ families. This case and a series of other serious crimes committed by youths sparked a debate over how to deal with minors who commit heinous crimes, leading the Diet to revise the Juvenile Law in 2000, including lowering the age for criminal responsibility from 16 to 14.